Social media marketing is the online tool that people use to share content, profiles, opinions, insights, experiences, perspectives, knowledge and media itself, thus facilitating conversations and online interaction between groups of people with interest on relevant subjects. The content of social media sites is primarily user-generated. Social media is evolving as a very powerful opportunity for reaching out to a huge number of potential business partners, buyers and prospects, and influencing them to form a favorable opinion about a brand, product, service, business, or company. As of Jan 2010, over 500 Million users actively participated in social media networks. As per Alexa, almost 40% of the world’s top-100 highest traffic websites are social media sites. 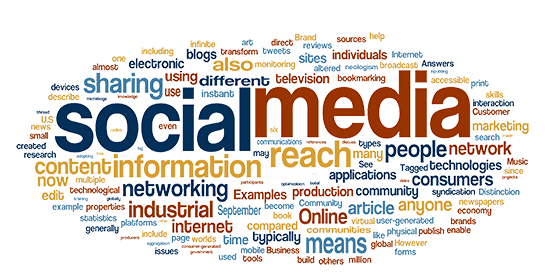 Social media marketing involves representation of client’s business through participation in social networking sites, social bookmarking sites, multi-media content sharing sites, industry forums, blogs and online press-release sites to generate a positive momentum of awareness, discussions, opinions and direct traffic to the client’s website. A Social Media Marketing campaign can address several business challenges. A customized social media campaign can be designed to achieve specific objectives. Following is a list of some of the prominent campaign objectives, which may be selected and prioritized based on client’s business requirements. Based on the campaign objectives indicated by the client in the Project Objectives & Scope Survey document, TMalone Marketing would design a customized social media marketing strategy to efficiently address the client’s business challenges. The Social Media Marketing campaign for your company/ organization will involve active participation in a variety of blogs, forums, social networking sites, social bookmarking sites, clubs, associations and other industry related sites and organizations. At the time of campaign initiation, we will identify the most popular industry sites and define activities involved in the campaign that would produce the desired results. We will determine the overall direction of the campaign. We will develop a company story; identify the primary messages, themes and topics of discussion. We will identify all participants; develop profiles & biographies and the responsible of each participant. We will set goals and objectives, and time lines for each. This plan will identify and explain what we are doing, how we do it, when we will do it, and what to expect from mouth to mouth. The efforts and results of this campaign will be monitored and measured by TMalone Marketing. Your Organization will receive monthly reports and a detailed analysis every month. You will always know where we are and what we need to do, to accomplish all the campaign goals and objectives. Facebook continues to lead social media brand usage. Social Networking AD spending is expected to reach $16.5 BILLION in 2017.